Be the first to share your favorite memory, photo or story of Wilma. This memorial page is dedicated for family, friends and future generations to celebrate the life of their loved one. 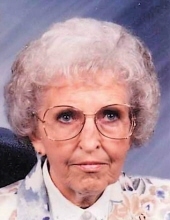 Wilma L. Buffenbarger, 89, of Waynesfield, OH, died early Saturday morning, April 13, 2019 at St. Rita’s Medical Center, Lima, OH. She was born on March 21, 1930 in McArthur Twp, Logan Co, OH, a daughter of the late Harry W. and Clara L. McCormick Taylor. On June 8, 1952, she married Richard Buffenbarger at Sugar Creek Church in Lima, and he preceded her in death on October 20, 2015. She is also preceded in death by seven siblings, Vertie Harford, Ruth Zimmerman, Marie Hites, Betty Snapp, Irene Oakley, Lena Harford and Carl Taylor. Wilma is survived by her son, Gary Alan (Kari) Buffenbarger of Waynesfield, grandson, Alan S. Buffenbarger, a sister-in-law, Wanda Taylor and several nieces and nephews. Wilma was a 1948 graduate of Stokes Local Schools. She was a secretary at Waynesfield-Goshen Schools for 27 years and continued to be a staunch support of the school following her retirement. She was a member of Waynesfield United Methodist Church. In her younger years, she enjoyed bowling. She enjoyed traveling, reading, watching girls’ basketball, and was an avid fan of the Cincinnati Red. She loved being with her family. Funeral services are 11:00 am, Wednesday, April 17, 2019 at Shoffstall Funeral Home, 205 S. Main St., Lakeview. Visitation is Tuesday, April 16th from 4-8 pm at the funeral home. Burial is in Walnut Hill Cemetery, New Hampshire, OH. Memorial Contributions may be given in her name to St. Rita’s Hospice or a veterans’ organization of the donor’s choice. To send flowers or a remembrance gift to the family of Wilma L Buffenbarger, please visit our Tribute Store. "Email Address" would like to share the life celebration of Wilma L Buffenbarger. Click on the "link" to go to share a favorite memory or leave a condolence message for the family.